Scientists know a lot about bacteriophages, viruses that infect bacteria. Medical practitioners likewise understand the clinical dangers of biofilms: slimy, antibiotic-defying aggregates of bacteria and organic substances that can stick to the walls and inner linings of infected organs and to chronic wounds, making infections excruciatingly hard to eradicate. But any link between bacteriophages and biofilms was unsuspected. Now, in a series of experiments prompted by a chance discovery, Stanford University School of Medicine investigators and their colleagues at three other research institutes have shown that a bacteriophage, or phage for short, is critical to the formation of biofilms by Pseudomonas, a bacterial pathogen behind numerous hospital-acquired infections, pneumonia cases and cystic fibrosis fatalities. The experiments are described in a study published Nov. 11 in Cell Host & Microbe. The study, the first to show that a phage can drive the formation of bacterial biofilms, is also the first to implicate any type of phage in causing chronic infections. The study also explains why biofilms can resist certain antibiotics, a discovery that could yield entirely novel therapeutic interventions. The researchers studied members of a family of long, filamentous phages known as Inoviruses. 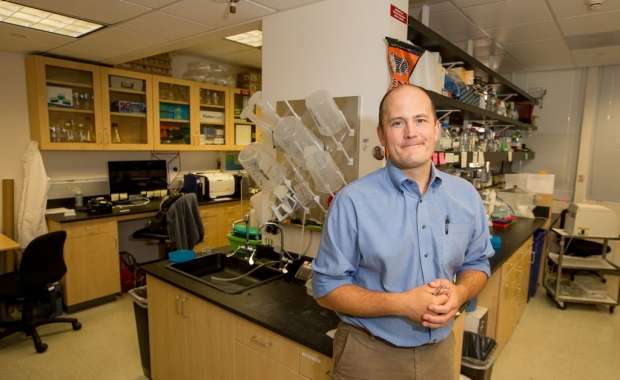 Other related phage species of the Inovirus family probably contribute to biofilm formation by diverse bacteria, said Paul Bollyky, MD, PhD, assistant professor of infectious diseases at Stanford. Bollyky shares senior authorship of the study with William Parks, PhD, a professor of medicine at Cedars-Sinai Medical Center in Los Angeles. Biofilms factor into 75 to 80 percent of hospital-acquired infections, such as those of the urinary tract, heart valves and knee-replacement prostheses, Bollyky said. "A familiar example of a biofilm is the plaque that forms on our teeth," he said. "You can brush twice a day, but once that plaque's in place you're never going to get rid of it." Like all viruses, a phage can reproduce itself only by climbing into a cell—in this case, a bacterial cell—and commandeering its replicative machinery. Usually that's lethal to the invaded cell, because the viruses' offspring break out of the cell by puncturing its outer membrane, destroying the cell. But Inoviruses don't do that. Instead, these long, thin viruses are extruded from the bacterial cell without causing damage. Indeed, as the study shows, in the presence of organic substances called polymers, they shelter the bacteria they've infected by forming goopy lattices—biofilms—able to repel or sequester electrically-charged small molecules, including many drugs. Members of the Inovirus family of phages infect a broad class of bacteria, encompassing Escherichia (for example, E. coli, which can aggregate into treacherous biofilms) as well as Pseudomonas. One Pseudomonas species alone, P. aeruginosa, accounts for about 10 percent of all hospital-acquired infections, many chronic pneumonia cases, a large fraction of wound infections associated with diabetes and much of the air-passage obstruction that afflicts cystic fibrosis patients. Serendipity played a major part in the revelation of a phage's role in bacterial biofilm generation. Patrick Secor, PhD, a senior fellow in microbiology at the University of Washington and the lead author of the study, was growing P. aeruginosa in culture and wondered if a substance called hyaluronan might be a good energy source for the bacteria. To test this, Secor mixed hyaluronan into the culture medium. Before his very eyes, a biofilm sprang up and spread rapidly through the culture. Hyaluronan is a polymer—a large organic molecule composed of many repeated subunits—and one of many made by living creatures. Other examples include DNA and mucin, the main constituent of mucus. A prominent feature of cystic fibrosis is the presence of high levels of extremely viscous mucus in the sputum. Cystic fibrosis, a genetic disease affecting one in 2,500 people, is deadly chiefly because of biofilms formed by P. aeruginosa, said Bollyky. "These biofilms fill up all the air spaces, and antibiotics can't seem to penetrate them," he said. "So, patients eventually succumb to infectious pneumonia." By adulthood, virtually all cystic fibrosis patients are colonized by P. aeruginosa, Bollyky said. Resulting biofilms eventually render their sputum extremely viscous, sticky and tough to get rid of short of a lung transplant, he said. Bollyky, a polymer-chemistry expert, is a good friend of Secor's, and they began working together. With their associates, they demonstrated that several polymers, including bacterial DNA and the mucin of cystic fibrosis patients, could trigger biofilm formation in P. aeruginosa—but only if the Inovirus was present. "The long, filamentous phages made by the bacteria interact with these polymers to form orderly structures that help biofilms stick to surfaces and resist removal," Bollyky said. "I always assumed that biofilms were chaotic networks of polymers and bacteria that look like the hairball plug you pull from the bottom of your shower drain. We were surprised to see that actually, in the presence of these phages, biofilm architecture is more like a crystal than a hairball. That higher-order organization makes these biofilms much more tenacious and formidable." Examining sputum from CF patients, some infected with P. aeruginosa and others not, the investigators identified phage particles in the infected patients' sputum. Adding phage particles to uninfected sputum samples induced the rapid generation and spread of highly organized biofilms in those samples. Further experiments may also explain why certain antibiotics work better than others against chronic infections. "The same physical properties that allow phage to organize biofilms also make them very efficient at sticking to antibiotics and trapping them within the biofilm. They never get close to the bacteria," Bollyky said. "These phages may be one reason why chronic infections with P. aeruginosa require long treatment courses of high-dose antibiotics." Phages are particularly good at binding some antibiotics, such as tobramycin, penicillin and azithromycin, while others, such as ciprofloxacin, are able to pass right through, the researchers found. The researchers documented similar biofilm dynamics using other bacterial species, including E. coli. All in all, bacteria carrying similar phages are responsible for about half of all hospital-acquired infections, Bollyky said. "If these findings can be validated, it could open the door to entirely new therapeutic targets for combatting hospital-acquired infections, complications of cystic fibrosis and much more," Bollyky said. His group is exploring approaches to target phages therapeutically, such as chelating agents that might disrupt biofilms' integrity and antiviral compounds that prevent Inovirus family members from reproducing. Fascinating! Science is so often about paying attention!